Heat oven to 400°F. In 10-inch skillet, cook sausage over medium heat 8 to 10 minutes, stirring occasionally, until no longer pink; drain. Remove sausage from skillet; set aside. In medium bowl, beat eggs with whisk. In same skillet, heat butter over medium heat. Pour eggs into skillet. Cook 3 to 4 minutes or until eggs are thickened but still moist. In medium bowl, mix sausage, scrambled eggs and cheese. Roll each biscuit into 4 1/2- to 5-inch round. Spoon about 2 tablespoons sausage mixture on half of each round. Fold other half over filling; press edges with fingers or fork to seal. Place on ungreased cookie sheet. 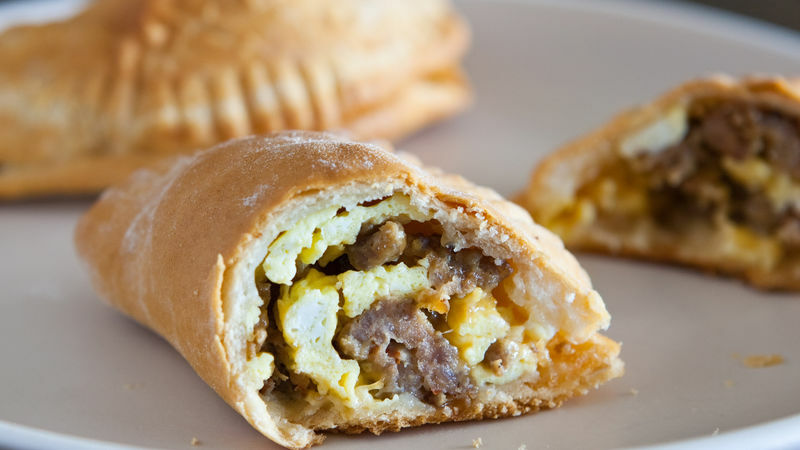 Maple-flavored pork sausage would be perfect for these breakfast pies. After hand pies come out of the oven, brush with melted butter, if desired.